Lowell Brewing Co.: Fine Time for Barleywine! 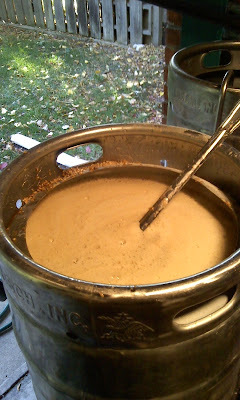 I brewed 10 gallons of English Barleywine this past weekend and 5 gallons of an English Mild. The 10 gallons of Barleywine came from the first runnings of the mash (OG 1.094 or finishing at ~10% alcohol) and the 5 gallons of English mild came from the second runnings and some sparge water (OG 1.035 or finishing at ~3.5% alcohol). I also added about a cup of malt extract to the mild along with some roasted grain. Note to self: 42 lbs. of grain is a wee bit over the max capacity of my mash tun! This is with a thick mash too, about 1 quart/lb. of grain. For those readers that do not brew, you probably have no idea what I am talking about. Feel free to ask me some questions! So, by the time these guys are done fermenting, I should have 15 gallons of beer. My oak barrel is empty, so I will be filling that with 5 gallons of the strong stuff and then putting the rest of the two beers in two kegs. The taps will then be full again! I'll have the Hopocaplypse, Bellamy Amber, English Mild, and English Barleywine pouring. I'm going to try and get all of the Oaked Townie Brown into bottles very soon and wax them. Christmas presents? Mug, the English Barleywine in the conical and Thimble, the English Mild in the carboy to the right!